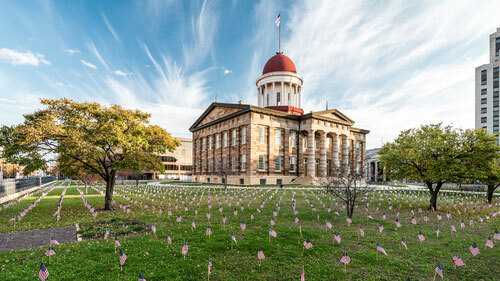 Springfield, Illinois isn’t often thought of for its manufacturing and industrial work and is more noted for its politics and government services. The Springfield workers compensation attorneys of Rosenfeld Injury Lawyers LLC work with enough clients to know that industry is still alive and well in the state’s capital, however. We are passionate about defending the rights of the average worker against attempts by large employers and insurance companies to exploit their efforts and sacrifices. With industrial work comes the possibility that workers will get hurt while performing their duties, and anyone who is injured deserves fair compensation for his or her injuries. If you or a family member was injured on the job and are in need of a Springfield, IL workers compensation lawyer, contact Rosenfeld Injury Lawyers LLC today for a free consultation. Due to Springfield’s political importance, the efforts of its blue-collar workers often go unnoticed by outsiders, but tens of thousands of workers through the greater Springfield area are employed in industrial field such as manufacturing, trade, transportation, agriculture and excavation. The city’s historic ties to the coal mining industry have ensured a steady supply of mining jobs. Here is an overview of the city’s industries and their contributions to Springfield’s economy. Transportation and freight— supplying over 4,600 jobs to workers throughout the area, the transportation industry is one of the largest industries in Springfield. Construction and excavation— the construction and excavation trades contribute another 4,000 jobs to the area and present a unique set of risks to workers. Installation, maintenance and repair services— mechanical occupations are often overlooked when considering workplace hazards, but mechanics and other repair workers are directly exposed to numerous dangers during their daily routines. Laborers. These workers are the backbone and muscle of the construction industry. They are subject to numerous hazards on the job site as well as the risk of overexertion or injuries due to repetitive motions. Pipefitters and steamfitters. Working with pipes and heating systems poses a unique risk due to exposure to asbestos, used to line many pipes for insulation. Working around heating and air conditioning systems also presents the risk of burns and injuries that result from the rupture of high pressure lines. Illinois employment laws require employers to provide insurance that protects employees in the event of injury. Workers’ compensation benefits are guaranteed and any attempt to deny a worker these benefits or the failure of an employer to provide the require insurance can result in civil and criminal action against the employer. However, the vast majority of claims are handled by insurance companies rather than victims’ employers. Our Springfield workers compensation lawyers protect clients from the traps and pitfalls that insurance companies use to avoid paying claims. Regardless of what your employer’s insurance company tells you, you are entitled to receive the following benefits, even if your injury was your own fault. The recovery of the full value of your past and future medical expenses. We rely on the testimony of experienced medical professionals to ensure you receive compensation for physical therapy and medical procedures you may require throughout your rehabilitation. The right to use any doctor you wish. One of the most important resources we have to offer our clients is access to a comprehensive network of doctors, including specialists who can prescribe the best recovery plan for you based on the extent of your injuries and your long term needs. A lump sum settlement to cover the cost of lost income and opportunities when you’ve been disabled due to your injuries. The Illinois Workers’ Compensation Commission has even set up a fund to provide compensation to cover cost of living increases over the lives of those who are no longer able to work due to their injuries. This protects your benefits from erosion due to factors such as inflation. Two-thirds of the value of your wages during your time off work. While you are sidelined, you may still receive pay during your physical recovery as long as you remain unfit to perform your duties. If your injuries were due to the reckless or negligent actions of a company or individual who was not your direct employer, you may be able to seek additional compensation in a civil lawsuit against them to recover compensation for your injuries. It is not uncommon for a third-party such as an equipment manufacturer to share responsibility as well. If an equipment malfunction or defect resulted in an injury, for example, the manufacturer can be held liable. Our Springfield work accident attorneys perform thorough investigations into the cause of every one of our clients’ accidents to determine if there are additional avenues available to pursue compensation. This helps us maximize the value of every claim and force employers and equipment manufacturers to change their ways. The type of compensation you may be able to collect when pursuing these claims includes damages for your pain and suffering, emotional distress, permanent disability and damages meant to punish the responsible party for deliberately failing to abide by safety regulations. In the event your workers’ compensation benefits do not cover the entire economic impact of your injuries, these damages often cover the difference. Rosenfeld Injury Lawyers LLC is an award-winning Illinois workers compensation law firm with a team of attorneys that specializes in the intricacies of work law and workers’ compensation claims. Our resources and experience allow us to help you focus on your own health while we recover damages to cover all of your expenses now and in the future. Roughly 86% of workers who file claims do so with the assistance of an attorney in order to protect their interests from employers and insurance companies that would otherwise take advantage. Allow us to protect your interests and work on your behalf. Contact us today to speak with one of our Springfield workers compensation attorneys and to schedule a risk-free case review. If you are unable to meet with us at our office, we are happy to meet with you wherever you are so that we can gather the information needed to begin an investigation into the cause of your injuries. We will explore all of your legal options with you before advising you on how to proceed and if we are ever unable to collect compensation on your behalf, our services will not cost you anything.